Dr. Kaiser earned a B.A. in English Language and Literature from the University of Chicago, Chicago, IL in 1997 with general honors. While there, she served as a Student Marshal, the highest undergraduate honor bestowed by the university. In 2001, she received her M.D. 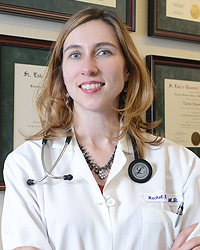 with an Area of Concentration in Medical Humanities from the Universityof Pittsburgh School of Medicine, Pittsburgh, PA. Dr. Kaiser completed her Internship and Residency in Internal Medicine from 2001-2004 and served as Chief Resident from 2004-2005 at St. Luke’s-Roosevelt Hospital Center, Columbia University College of Physicians and Surgeons, New York, NY. In 2007, she received a Master of Public Health degree in epidemiology from the University of California, Berkeley and in 2008 she completed her Rheumatology Fellowship at the University of California, San Francisco (UCSF), CA. Prior to joining Arthritis and Rheumatism Associates, P.C., Dr. Kaiser was on the faculty for several years as an Assistant Professor in the Division of Rheumatology at UCSF. In that position, she taught and mentored medical students, residents, and Rheumatology fellows in the classroom, on the inpatient Rheumatology consult service, and in the Lupus clinic. She was also a member of the UCSF medical school admissions committee. Dr. Kaiser has received numerous honors and awards including the American College of Rheumatology (ACR) Distinguished Fellow Award. She has received grants from the Arthritis Foundation, ACR, and UCSF in support of her research examining genetic risk factors for thrombosis – or blood clots – in patients with lupus. She has presented her work at international meetings as well as authored many publications. Dr. Kaiser is Board Certified in both Internal Medicine and Rheumatology and is a member of the Arthritis Foundation, a fellow of the American College of Physicians, and a fellow of the American College of Rheumatology. Dr. Kaiser is a certified clinical densitometrist. She is a member of the Medical Scientific Advisory Council of the DC/Maryland/Virginia chapter of the Lupus Foundation. She has been recognized as an outstanding specialist in Rheumatology in Washingtonian Magazine. Dr. Kaiser has experience in all areas of rheumatology and has a special interest in lupus and osteoporosis. She also speaks French.